Introduction: Despite its simplicity, efficiency and reliability, Sri Lanka has not used the Annual Risk of Tuberculosis Infection (ARTI) to assess the prevalence and efficiency of tuberculosis (TB) control. Hence, a national tuberculin survey was conducted to estimate the ARTI. Materials and Methods: A school-based, cross-sectional tuberculin survey of 4352 children aged 10 years irrespective of their BCG vaccination or scar status was conducted. The sample was selected from urban, rural and estate strata using two-stage cluster sampling technique. In the first stage, sectors representing three strata were selected and, in the second stage, participants were selected from 120 clusters. Using the mode of the tuberculin reaction sizes (15 mm) and the mirror-image technique, the prevalence and the ARTI were estimated. Results: The prevalence of TB estimated for urban, rural and estate sectors were 13.9%, 2.2% and 2.3%, respectively. The national estimate of the prevalence of TB was 4.2% (95% CI = 1.7-7.2%). ARTI for the urban, rural and estate sectors were 1.4%, 0.2% and 0.2%, respectively, and the national estimate was 0.4% (95% CI = 0.2-0.7%). The estimated annual burden of newly infected or re-infected TB cases with the potential of developing into the active disease (400/100 000 population) was nearly 10-fold higher than the national new case detection rate (48/100 000 population). Conclusion: The national estimate of ARTI was lower than the estimates for many developing countries. The high-estimated risk for the urban sector reflected the need for intensified, sector-specific focus on TB control activities. This underscores the need to strengthen case detection. Repeat surveys are essential to determine the annual decline rate of infection. Despite the feasibility and usefulness of estimating ARTI in low resource countries, this has not been conducted in Sri Lanka. Although Sri Lanka is considered as a low prevalent country in the South-East Asia region,  around 9000 new TB cases are notified every year. Nearly 60% of these are smear-positive, pulmonary TB cases. Hence, conducting a nation-wide tuberculin survey to determine the prevalence of TB and the ARTI among Sri Lankan children, as an indicator of recent TB situation in the community, is timely and appropriate. This also helps determine whether there is an under-reporting of new cases through the routine disease surveillance system. Moreover, it would be a useful reference for future estimates, repeat tuberculin surveys to assess epidemiological trends and the impact of TB control activities in the country. A nation-wide, school-based, cross-sectional tuberculin survey. We considered a prevalence of 10% based on the results of a south Indian study among children aged 10 years with a BCG scar  as no estimates for Sri Lanka were available. For a relative precision of 10%, level of significance of 5% and a design effect of 1.5, the estimated sample size was 5186. This estimated sample size was distributed proportionately among urban, rural and estate strata based on 2001 population census data. Accordingly, the number of study participants required from urban, rural and estate sectors were 936, 3978 and 272, respectively. A two-stage sampling procedure was used to select the study sample. In the first stage, we listed all urban, rural and estate sectors in the country separately. These sampling frames were used to sample urban, rural and estate sectors for the study. Urban and rural sectors in the Northern Province were excluded from this sampling frame due to inaccessibility. The sector-categorization used in the national census of 2001 formed the basis for categorization. Guided by the WHO recommendation to select 5-25% of the total geographical units in a stratum based on the operational convenience and sample size,  we selected 6 (35%) out of 17 sectors listed in the urban stratum, 8 (40%) out of 20 sectors listed in the rural stratum and 3 (20%) out of 15 sectors listed in the estate stratum. Overall, 12 (48%) districts in the country were represented in sectors selected under urban, rural and estate strata in the study. In the second stage, the required number of clusters was selected from three individual strata. A 'year 5' class in a school was considered as a cluster. All 'year 5' classes in selected sectors, the total number enrolled in a class and the cumulative number of 'year 5' school-children were listed separately for all three strata. The required number of clusters within the respective stratum was selected probability proportionate to the size (PPS). The required number of clusters from a stratum was determined by the cluster size that depended on the median number of children in clusters within a stratum. Based on this, the total number of clusters that was required to select the estimated sample size was 120. Within a selected cluster, school-children who were eligible for the study with the parental consent were enrolled. When the number of eligible children in a selected cluster exceeded the required cluster size, the required numbers of participants were selected randomly. In a cluster, after explaining the purpose of the study and obtaining the written parental consent, a medical officer appraised the eligibility of students. The Public Health Nursing Sister (PHNS) noted down the availability of a BCG scar in an eligible child. Then, a trained nursing officer administered 0.1 ml of tuberculin I (1 TU of PPD RT 23 stabilized with Tween 80), according to the standard protocol. The PHNS recorded this procedure as 'satisfactory' or 'un-satisfactory' using standard criteria. In 72 h after tuberculin administration, the test-reader measured the size of the tuberculin. To determine the prevalence of infection, justifying the appropriateness of using the current batch of tuberculin and ensuring the comparability of results with other studies, Welisara Chest clinic administered tuberculin to 82 smear-positive TB patients within 1 week of diagnosis. With the expected frequency based on moving averages, the sensitivity of the batch of tuberculin used was 86.7% at 10 mm and 74.6% at 14 mm. Since these values were approximate to the sensitivity of 90% at 10 mm and 75-85% at 14 mm demarcation reported in different studies all over the world, ,, tuberculin PPD RT 23 was demonstrated to be appropriate for the field study. While the study was in progress, due to death of a child recipient of rubella vaccine in the school programme, enrolment of study participants had to be limited to 103 clusters as all injection procedures were not permitted until a further notice by the Ministry of Education. Of the estimated sample size of 5186, only 4352 (84%) study participants were enrolled due to the death of a school-child following rubella vaccination. Overall, the enrolment rates in urban, estate and rural sectors were 73.0%, 98.5% and 85.6%, respectively. The number of children administered tuberculin satisfactorily was 4318 (99.2%). This consisted of 2346 (54.3%) girls and 1972 (45.7%) boys. The majority (n = 4238, 98.2%) were vaccinated with BCG in infancy. The BCG scar was found in a great majority (n = 4039; 95.3%). Of the children who were administered tuberculin, 4202 (97.3%) were test-read and analysed. The frequency distribution of tuberculin reaction sizes among children aged 10 years irrespective of the BCG scar and vaccination status is given in [Figure 1]. The proportion of children without a reaction was 57.1%. A second mode of reactions potentially attributable to the infection with tubercle bacilli is distinguishable at 15 mm, although not distinctly clear. However, in this case, an anti-mode could not be identified. Therefore, the mode of reaction sizes of smear-positive Pulmonary Tuberculosis (PTB) cases was considered as the alternative mode of the frequency distribution of reactions sizes attributable to TB infection in the study participants [Figure 2]. The proportion without a reaction among smear-positive PTB patients was 7.4%. 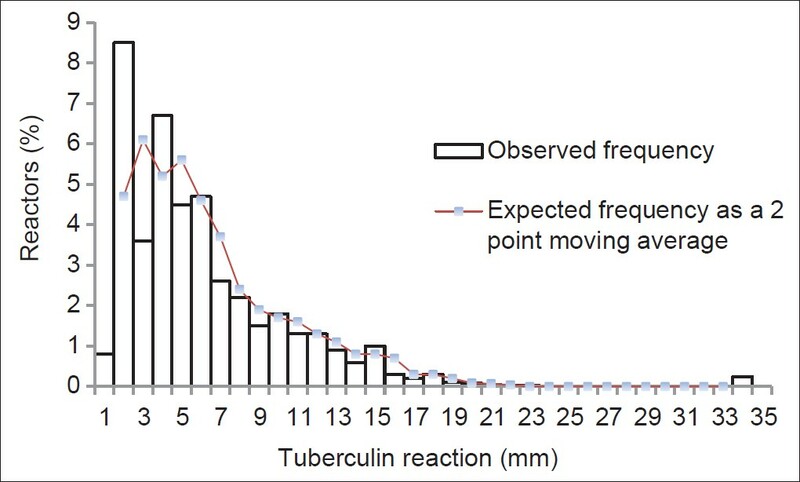 Although this frequency distribution of tuberculin reaction sizes among smear-positive PTB cases is generally unimodal, in this series, we found two clearly visible modes at 15 mm and 20 mm. However, when accounted for the possible digit preference by smoothening data in terms of converting to two point moving averages, the mode was at 15 mm. This overlapped with the value of the suspected mode of reactions assumed to be attributable to the infection in the study participants. 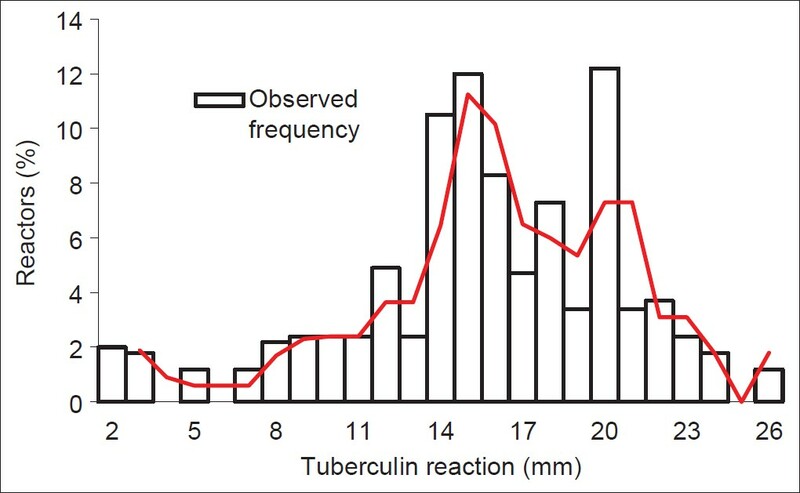 Hence, the frequency assumed to be TB among study participants was determined by doubling the frequency of tuberculin reactions larger than 15 mm and adding to the frequency at 15 mm (mirror-image technique). The estimated prevalence and ARTI based on this frequency assumed to be TB are indicated in [Table 1]. The prevalence of TB and ARTI computed was similar among both the sexes. The prevalence among males and females were 4.2% (95% CI: 0-12%) and 4.1% (95% CI: 1.4-6.8%), respectively. The ARTI for males and females were 0.4% (95% CI: 0-1.2%) and 0.4% (95% CI: 0.1-0.7%), respectively. However, in contrast to the estate (2.3%, 95% CI: 0-6.4%) and rural sectors (2.2%, 95% CI: 0-5.7%), the prevalence was much higher in the urban sector (13.9%, 95% CI: 8.4-19.4%). The national prevalence was 4.2% (95% CI: 1.7-7.2%), while the ARTI was 0.4% (95% CI: 0.2-0.7%). Although the estimation of ARTI is the simplest, most-efficient and reliable indicator of the epidemiological situation of TB, many developing countries still do not estimate ARTI. The present study was the first national tuberculin survey that enabled estimation of the prevalence and the annual risk of TB in Sri Lanka. It provided baseline data to evaluate the impact of disease control and for future appraisals of epidemiological trends. One limitation of this study, performed in 2009, was its applicability of results to 2004 (2009 - the age of the study population/2). Assessing the trends in repeat surveys can minimize this limitation. One general recommendation in planning surveys to determine ARTI is that national-level surveys are preferred in smaller countries, while, in larger nations, separate surveys are preferred at sub-national levels with adequate, separate sample sizes for each stratum. We, as a small country, primarily planned for computation of a single-national estimate. In spite of this, we present separate estimates for urban, rural and estate sectors. However, over sampling in urban, rural and estate strata in this study or conducting independent surveys in different strata, including different socio-economic and age groups with adequate strata specific samples, would have given more precise strata-specific estimates of the ARTI. It could have resulted in better delineation of the disease prevalence and enhanced the understanding of the challenges of disease control and planning remedial measures. Our total sample size was an under-estimate by about 60%, given the fact that we used 10% prevalence of TB based on south Indian estimates of the same age group as opposed to a figure closer to the national estimate (4.2%) derived in this study. We enrolled only 82.4% of the desired sample size, and we had to discontinue the study following the government circular temporarily stopping all injection procedures in schools following the death of the rubella vaccine recipient. This response rate (82.4%) was slightly above the 80% threshold recommended by Sackett  to be considered internally valid. However, non-enrolment of 27% of children in the urban sector is indeed a great limitation to interpret the validity of the high estimate of ARTI for the urban sector. The estimate of ARTI for many other developing countries is in the range of 1-3%. ARTI for Philippines was 2.3%,  while for Algeria, Egypt, the Republic of Korea, Kenya and United Republic of Tanzania, it was <2%. ,,,, Thus, by the standards of developing countries, our estimate reflected the effectiveness of TB control activities in the country. However, no comments can be made on trend due to the non-availability of previous national estimates. Like in many countries, ,, a higher ARTI (1.4%; 95% CI: 0.8-2.1%) has been observed in the urban sector. The slightly wide confidence interval of the urban estimate indicates the small sample size, mainly due to pre-mature cessation of the study. Both estate and rural sectors have estimates suggestive of low transmission of TB infection. The higher risk of infection in the urban sector than in the rural and estate sectors may be due to high population density and poor socio-economic situation. Results underscore the need for paying greater attention to the urban sector and indicate possible weaknesses in the operation of the control programme in urban areas. Our study concluded that the national estimate of ARTI was lower than that reported in many developing countries. However, a relatively high risk was observed in the urban sector as compared with the estate and rural sectors. Although still far from the ideal, the relatively lower ARTI at the national level may reflect improving socio-economic status, the better and organized delivery of general healthcare as well as organized TB control activities. Despite this lower risk, nearly 10-fold low annual new case detection rate relative to the expected annual burden of newly infected and re-infected cases based on our study is a concern. Therefore, in the light of our findings, the National TB Programme needs to strengthen its efforts to detect newly infected or re-infected disease load capable of progressing to the disease. In addition, a fresh approach for a package of control activities in urban areas of the country is required. 1. Chadha VK, Vaidyanathan PS, Jagannatha PS, Unnikrishnan KP, Mini PA. Annual risk of tuberculosis infection in the northern zone of India. Bull World Health Organ 2003;81:573-80. 2. Chadha VK, Kumar P, Gupta J, Jagannatha PS, Lakshminarayana V, Magesh V, et al. The annual risk of tuberculosis infection in the eastern zone of India. Int J Tuberc Lung Dis 2004;8:537-44. 3. Indira Kumari KS, Sivaraman S, Joshi M, Pillai SN. Annual risk of tuberculosis infection: An estimate from ten year old children in Trivandrum district. Ind J Tub 2000;47:211-7. 4. World Health Organization, Regional Office for South East Asia. Generic guidelines for the estimation of the annual risk of tuberculosis infection. New Delhi: WHO-SEARO; 2006. 5. Sashidara N, Chadha VK, Jagannatha PS, Ray TK, Manta RN. The annual risk of tuberculosis in Orissa state, India. Int J Tuberc Lung Dis 2004;8:545-51. 6. World Health Organization, Regional Office for South-East Asia. Tuberculosis in South East Asia: Country profile, Sri Lanka. New Delhi: WHO-SEARO, 2011. 7. National Program for Tuberculosis Control and Chest Diseases. Achievements. Colombo: NPTCCD. [ http://sites.google.com/site/nptccdsrilanka/reports-publications [Last accessed on 2013 May 31]. 8. Gopi PG, Subramani R, Kolappan C, Venkatesh Prasad P, Narayanan PR. Estimation of annual risk of tuberculosis infection among children irrespective of BCG scars in the south zone of India.Ind J Tub 2006;53:7-11. 9. World Health Organization, Regional Office for South-East Asia. New Delhi: WHO-SEARO; 2009. 10. Srisaravanapavanantha A, Dissanayake NN, Sarathchandra J. BCG vaccination scars of children under five years in a tertiary care hospital in Sri Lanka. Sri Lanka J Child Health 2008;37:81-4. 11. Statens Serum Institute. Core summary of product characteristics. Tuberculin PPD 23 SSI. Available from: http://www.ssi.dk/sw46139.asp [Last accessed on 2013 May 9]. 12. Lwanga SK, Lemeshaw S. Sample size determination in health studies: A practical manual. Geneva: World Health Organization; 1991. 13. Sri Lanka, Department of census and statistics. Population characteristics: Census of population and housing. Colombo, 2001. Available from: http://www.statistics.gov.lk/PopHouSat/Pop_Chra.asp [Last accessed on 2013 May 9]. 14. Bleiker MA, Sutherland I, StybloK, ten Dam HG, Misljenovic O. Guidelines for estimating the risk of tuberculosis infection from tuberculin test results in a representative sample of children. Bull Int Union Tuberc Lung Dis 1989;64:7-12. 15. Cauthen GM, Pio A, ten Dam HG. Annual risk of tuberculosis infection. Geneva: World Health Organization; 1988. 16. Chadha VK, Vaidyanathan PS, Jagannantha PS, Unnikrishnan KP, Savanur SJ, Mini PA. Annual risk of tuberculosis infection in the western zone of India. Int J Tuberc Lung Dis 2003;7:536-42. 17. Sackett D. Bias in analytical research. J Chronic Dis 1979;32:55-63. 18. Raviglione MC, Snider DE, Kochi A. Global epidemiology of tuberculosis-mortality and morbidity of a worldwide epidemic. JAMA 1995;273:220. 19. Tupasi TE, Radakrishna S, Pascual ML, Quelapio MI, Villa ML, CO VM, et al. BCG coverage and the annual risk of tuberculosis infection over a 14 year period in the Philippines assessed from the nationwide prevalence surveys. Int J Tuberc Lung Dis 2000;4:216-22. 20. Liard R, Tazir M, Boulahbal F, Pedrizet S. Use of two methods of analysis to estimate the annual rate of tuberculosis infection in Southern Algeria. Tuber Lung Dis 1996;77:207-14. 21. Hong YP, Kim SJ, Lew WJ, Lee EK, Han YC. The seventh nationwide tuberculosis prevalence survey in Korea. Int J Tuberc Lung Dis 1998;2:27-36. 22. Bosman MC, Swai OB, Kwamanga DO, Agwanda R, Idukitta G, Mislejnovic O. National tuberculin survey of Kenya 1986-90. Int J Tuberc Lung Dis 1998;2:272-80. 23. El lbiary S, de Coster EJ, Tolba FM, van Maaren P, Wasily L, van Cleeff M, et al. Trend in the annual risk of tuberculosis infection in Egypt, 1950-96. Int J Tuberc Lung Dis 1999;3:294-9. 24. Tuberculosis control in the era of the HIV epidemic: Risk of tuberculosis infection in Tanzania, 1983: 1998. Int J Tuberc Lung Dis 2000;5:103-12. 25. World Health Organization, Regional Office for South-East Asia. Tuberculosis control in the South East Asia Region-2012. New Delhi: WHO-SEARO; 2012.